What is the best hamster cage in the market? This is a question most people ask when they are looking for a quality hamster cage. We are here to help you find the best cage for your hamster. After doing research for over 50 hours, we found some great cages for your little, fantastic hamster. Hamsters are among the best pets to get for your kids if you want them to learn responsibility, but they are great for adults as well. Animal lovers, especially those living in smaller homes or those who don’t have a lot of time to take care of other pets such as dogs or cats, prefer to keep hamsters. Of course, they need care; they need food, exercises, water, attention, and cage cleaning. Speaking about cages, a hamster cage is the most essential item to have if you love your hamster. It is where your furry companion will sleep, eat, play, and poop; they ensure your hamster’s health and well-being are well-taken care of. Therefore, you need a cage with enough space for your furry friend to exercise and live comfortably. To find the best cage for your hamster, we have reviewed top 10 best hamster cages 2019. But before then, we have prepared an exhaustive buyer’s guide with all the information you need to know about finding the right cage. If you are in a hurry, check out our recommendation list below. The first and most important factor to consider is size. When you are buying a home for your little hamster, you have to go for one that provides as much space as possible. Although hamsters are little, that doesn’t mean they be restricted in a little space. They need enough space to play, exercise and live happily. Experts recommend that a cage of 30X15X15 inches is ideal for hamsters. This ensures your hamster get enough ventilation and plenty of space. If you are looking for a hamster cage dwarf or Syrian hamster cage, you should look at the vertical space and floor square. Syrian hamster needs a floor space of 150 square inches and height of 17.5. A dwarf hamster needs a floor size of 120 square inches and a vertical space of 15 inches. This is an essential consideration because mischievous hamsters chew whatever they get their mouth on. If you go for a plastic-based material cage, some will chew them and escape. The best way is to have one with metal and plastic build. On the other hand, you can provide extra chewing stuff so that they don’t get time to chew the housing. Besides, ensure they have enough playing space and playing toys. Metal-based cages may be quite pricey but they last longer compared to their plastic counterparts. You also need to consider the spaces between the wires of your cage as large gaps make them feel insecure and easy to escape. Obviously, you don’t want any of these two scenarios to happen. Therefore, make sure the cage you are buying has a bar space of ½ inches. This not only makes them feel secure but ensure enough ventilation. Therefore, pick the right cage with sizeable bar space not exceeding ½ inches. Hamster cage dwarf should have bar space of 1/3 inches. When selecting best hamster cages, watch out for the type of ventilation system present and how it is worked out on the cage. The best hamster cage needs to have enough space and ventilation so that your hamster can breathe without difficulties. Remember to set the cage in an area that is not too hot or too cold. Also, it should be in an area that is air-conditioned or by the window side. It should be in an area with normal room temperature. It is true that you have to keep your cage clean by having a regular cleaning routine. Failure to clean the entire cage will make it stink due to hamster discharge. Therefore, ensure you go for a cage that is easy to clean and maintain. A hamster cage with a tube, storage, tunnels, and ladders is the best cage, but it accumulates dirt in all these areas. If you have to go for a hamster cage with these features, go for a larger one so that you can have enough space to clean all these parts. Also, if you can find one with detachable parts, that’s a plus as you can clean each one by one. However, don’t be afraid of going for a cage with many parts because you are afraid of cleaning. The more the parts, the better it will be for your hamster. This differs from person to person. Some people prefer metal-wire based cages while others prefer glass hamster cage models for their furry friend. On the contrary, most kids will prefer any cage with vivid colors and one with many toys, ladders, and tunnels to play. Ensure you weigh the pros and cons of each design to ensure you are getting a cage worth the money. 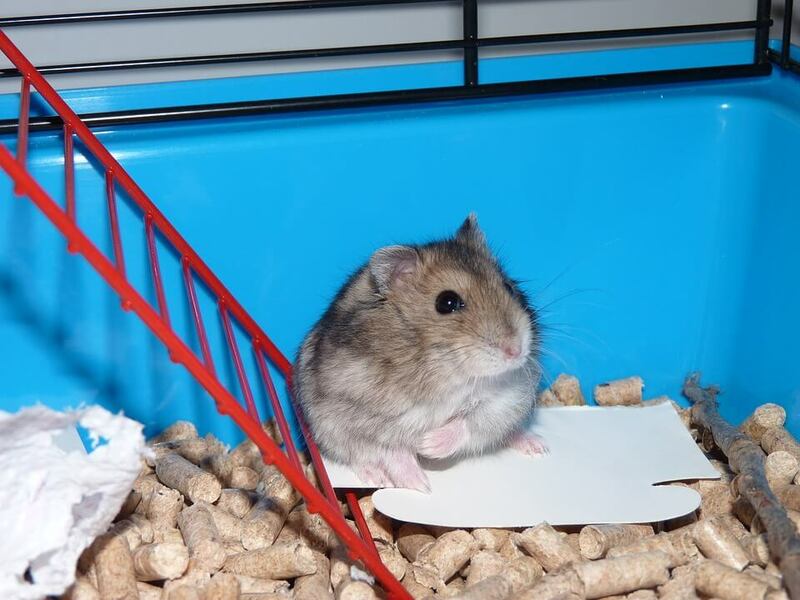 If your hamster escapes from their cage, it can be tough to find it since they are mischievous and very active. Besides, they ruin furniture with their sharp teeth as they like chewing anything that comes their way. Therefore it is vital to get a cage that has clipping doors or topper doors that do not open easily with push or sidekicks. Fortunately, all the cages we have reviewed here have secure doors that your hamster cannot open. These are the most popular cages, and most hamster owners love the way they are constructed. They are not only aesthetically appealing but are also safe and secure thanks to the wire construction. Besides, it offers enough ventilation by allowing air to pass through the bar spaces. You have to ensure the wire is strong enough as weak wires can be chewed by hamsters when they are trying to find an escape plan. Go for wire hamster cages constructed of heavy materials. These are kid’s favorite because most of them come with a lot of toys and accessories. Most have a tunnel, ramp, dish, hideaway, bowl, wheel, etc. This offers your hamster a lot of accessories to play with. However, on the downside, they are hard to clean, but their aesthetic appeal surpasses this downside. One thing to keep in mind when choosing plastic-based hamster cage is to ensure you go for the one constructed from tempered plastic. Also, ensure it has enough ventilation system for air circulation. Some people love hamster cages glass. This is because they are transparent and this you can view what your hamster is doing from the outside. Thought they are quite heavy, most hamster lovers like them for their transparency. They have an opening on their top, and thus you can decorate it more by adding the stuff you like the most. Hamster moves around and gets tired just like us. Therefore, they will need somewhere to rest in. Therefore, make sure your cage comes with perfect beddings. Also, make sure that the bedding is heavy enough to absorb any smell of urine, poops, and other smelly things. Go for one with beddings that are machine washable. This is a crucial toy that acts as an exercise tool. Hamsters love them a lot. A hamster cage with this toy is excellent for your hamster as it helps them burn fat quickly thereby enabling them to live a healthy life. Some are made of metal, and others are made of plastic or wooden material. If your hamster cage comes with playing tubes, well and good. However, if it doesn’t come with tubes, buy some for them. Playing tubes come in many angles including round, long, triangle, etc. These tubes make them run through the cage and thus live a healthy life. Very few cages come with this accessory but if you find one with a small food dish, the better. You can buy a few sets of food dishes to have a variety and options when one is dirty. Your hamster will need clean and fresh water. Some cage feature a water lien system or water bottle. Ensure to provide water to your hamster and clean the water bottle regularly. Most large hamster cage models have tunnels to give hamsters more room to play in. Tunnels make them happy as they think it is wildlife adventure. You can buy more tunnels for them with different designs and color variation. One of the favorite plays for most hamsters is hide-and-seek. Therefore, a cage with hideaways will be ideal for your hamster as it enables them to play more. They bring happiness in their life. You can buy more hideaways for your hamster. This is hands down, one of the most popular cages among pet owners. The interior space is 45 x 24 inches. It is an ample space that can fit up to 2 hamsters. Better yet, you choose among different sizes to fit your pet. For pet owners looking for a versatile hamster habitat, this a suitable pick for you. It offers eight square feet of living space and has been approved by vets. It provides multiple access points to make it easy to access your pets. The cage offers a lightweight construction and hence a suitable hamster cage for a tour. The cage keeps small animals such as the dwarf hamsters in mind. The cage offers a large tubby base that gives ample space for exercise and additional accessories. The tiny dwarf hamsters will enjoy the rounded corners with no pinch points. Furthermore, the cage has durable construction to keep your pet secure with a wire latch locking mechanism. This cage is easy to set up in minutes without any tools required. What’s more, that large cage offers ample space for your hamster to run and place to hide under the balcony. The PP plastic bottom combines with the iron wire frame form a high-quality enclosure and hence a long lasting home for your friend. If you need a great hamster cage that offers a clear view of what’s inside, the IRIS pet cage is an option to consider. It comes with 3 levels where your hamster can explore through the plastic ladder provided. Better yet, the doors on top make it easy to access your pet. This cage from Midwest offers many good things and has been designed to meet your hamster’s every need. Accessing your pet is easy through the large swinging double doors that feature critter-proof latches to ensure they open effortlessly with one hand. This hamster cage for sale from Ferplast is one of the best around at its price. The modular enclosure offers 2 levels to ensure that your furry friend finds places to explore. This is one of the best dwarf hamster cages that is escape-proof as long as the door stays closed. If you’re looking for a simple design, this cage from Lixit is one of them with a lot of space for your hamster to roam around. The sturdy cage is made with allergy-friendly and high-quality material, and you can rest assured that it will offer a long-lasting service. This multi-floor hamster cage features a quality construction material as well as chew proof. The large hamster cage Kaytee offers ample living space to keep your hamster happy. The unit is easy to clean and include multiple accessories to provide more amusement to your little friend. The addition of the tunnel system that joins the living area with the bedding compartment is a fantastic feature that most customers and pets seem to like. The cage has adequate ventilation and is easy to clean and maintain. The hamster cage for sale includes an ample space and lot of amazing features. Hamsters are engaging and entertaining animals and can be an ideal first-time pet. By getting them a cage, you will be able to watch them play, run on their exercise wheel, or relaxing on their bedding. When selecting the best cage for your hamster, find one that suits their needs. All the above hamster cages we have reviewed in this review are the best in the market, and you will not go wrong by choosing any of them. How Long Does a Dog Live With Cushing’s Disease? 8 Effective Ways: How to Sedate a Cat? © 2018 - petlovethat.com. All Rights Reserved.